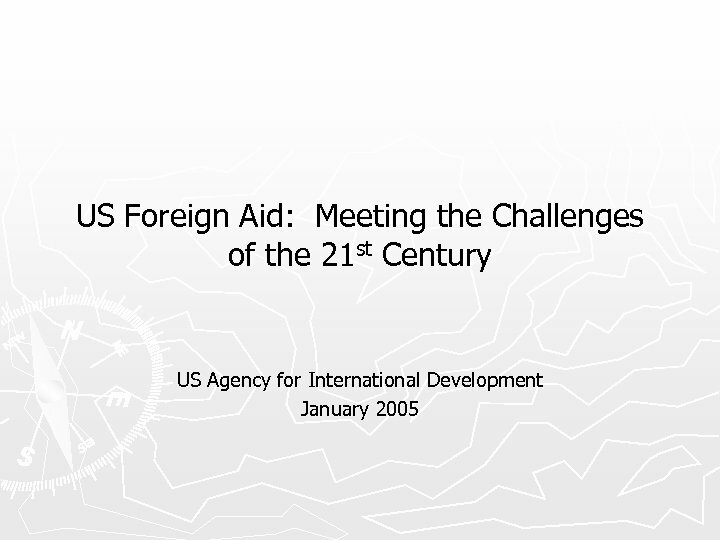 Mission State Department and US Agency for International Development ► Create a more secure, democratic and prosperous world for the benefit of the American people and the international community. 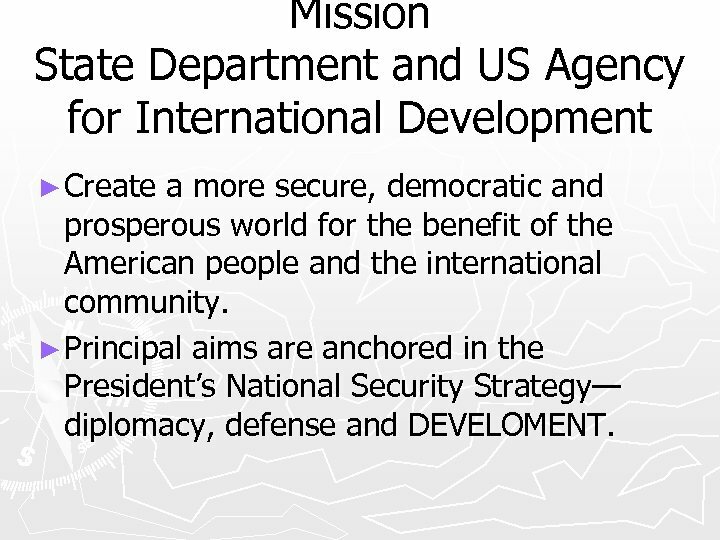 ► Principal aims are anchored in the President’s National Security Strategy— diplomacy, defense and DEVELOMENT. 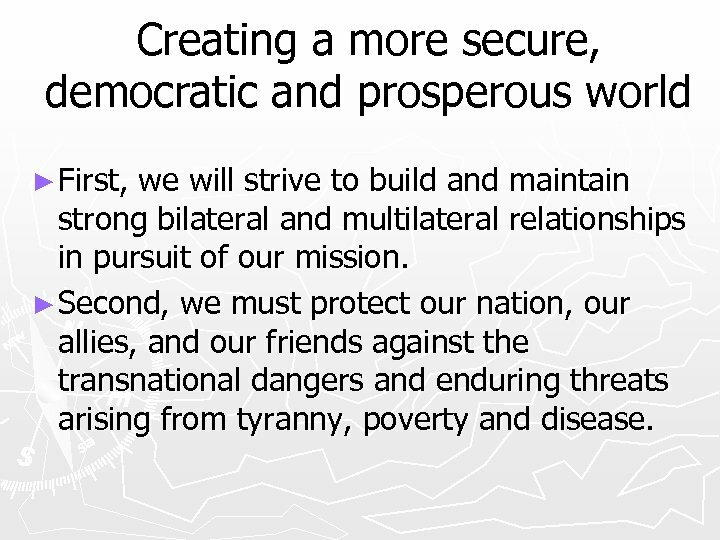 Creating a more secure, democratic and prosperous world ► First, we will strive to build and maintain strong bilateral and multilateral relationships in pursuit of our mission. ► Second, we must protect our nation, our allies, and our friends against the transnational dangers and enduring threats arising from tyranny, poverty and disease. 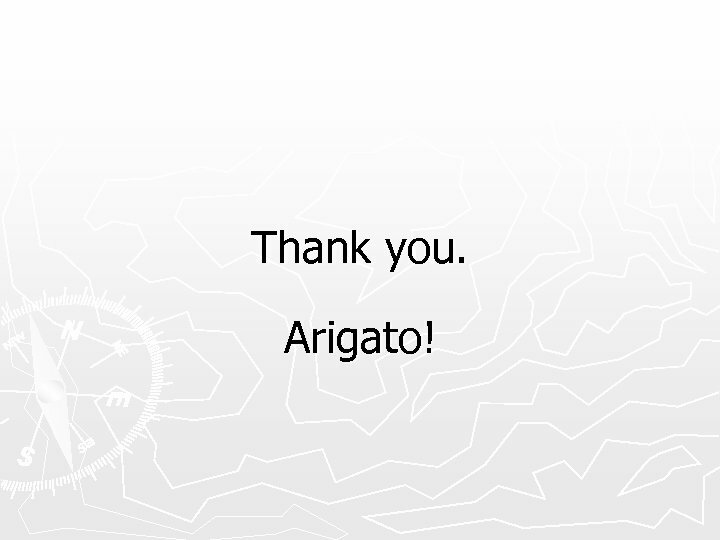 Create a more secure, democratic and prosperous world (cont. ) 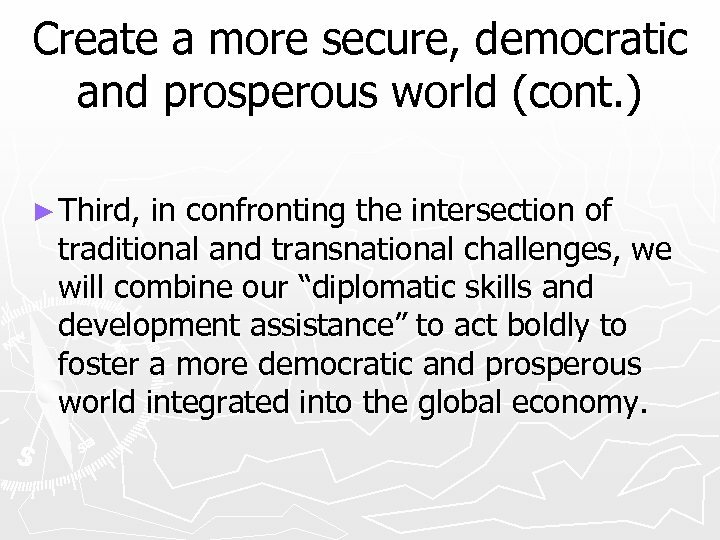 ► Third, in confronting the intersection of traditional and transnational challenges, we will combine our “diplomatic skills and development assistance” to act boldly to foster a more democratic and prosperous world integrated into the global economy. 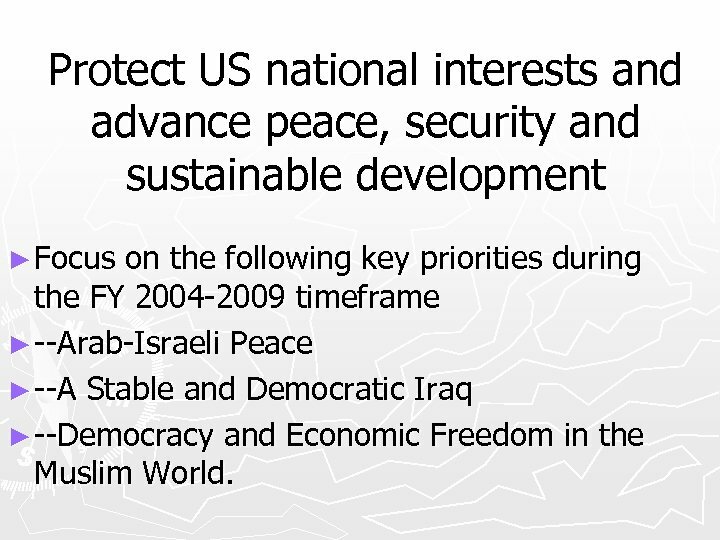 Protect US national interests and advance peace, security and sustainable development ► Focus on the following key priorities during the FY 2004 -2009 timeframe ► --Arab-Israeli Peace ► --A Stable and Democratic Iraq ► --Democracy and Economic Freedom in the Muslim World. 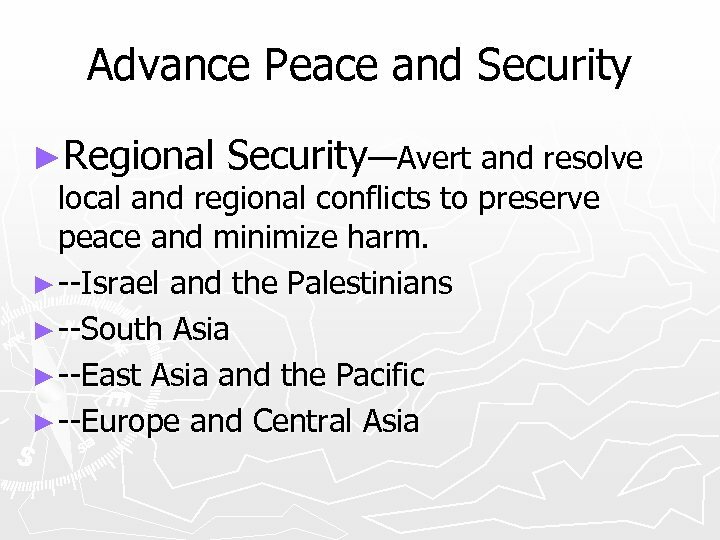 National interests, advance peace and security, and sustainable development (cont. ) 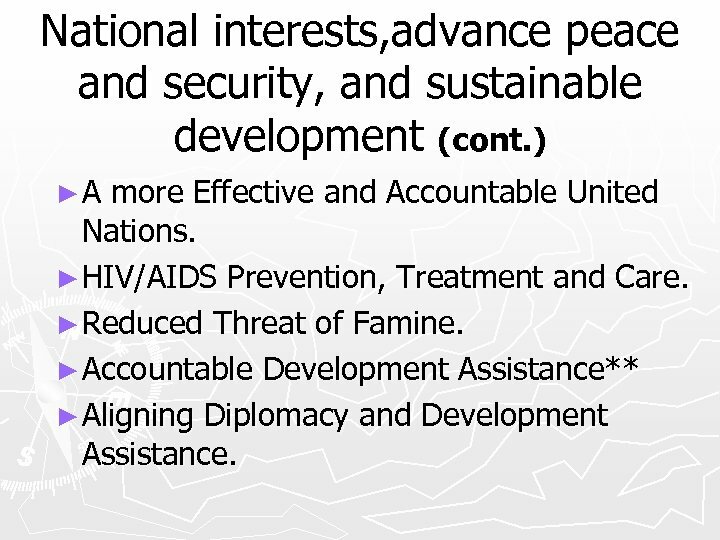 ►A more Effective and Accountable United Nations. ► HIV/AIDS Prevention, Treatment and Care. ► Reduced Threat of Famine. 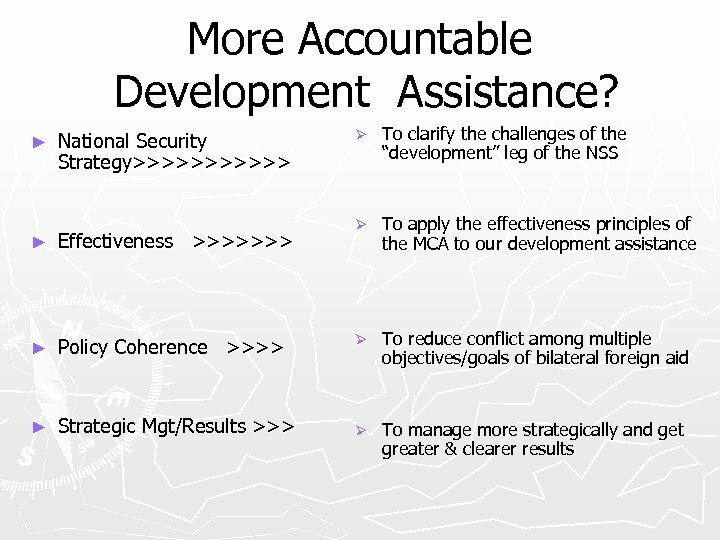 ► Accountable Development Assistance** ► Aligning Diplomacy and Development Assistance. 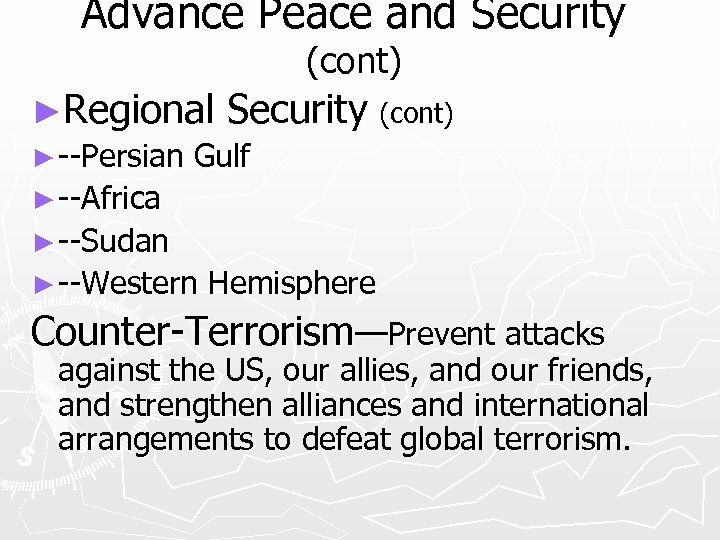 Advance Peace and Security (cont) ►Regional Security (cont) ► --Persian Gulf ► --Africa ► --Sudan ► --Western Hemisphere Counter-Terrorism—Prevent attacks against the US, our allies, and our friends, and strengthen alliances and international arrangements to defeat global terrorism. 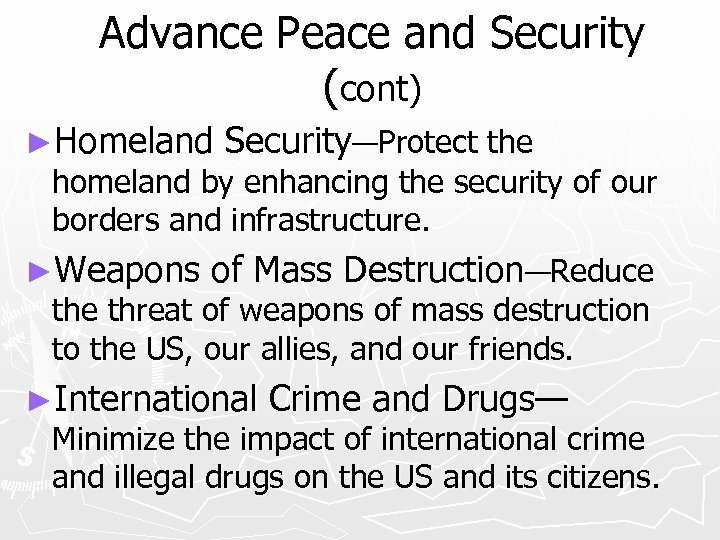 Advance Peace and Security (cont) ►Homeland Security—Protect the homeland by enhancing the security of our borders and infrastructure. ►Weapons of Mass Destruction—Reduce threat of weapons of mass destruction to the US, our allies, and our friends. ►International Crime and Drugs— Minimize the impact of international crime and illegal drugs on the US and its citizens. 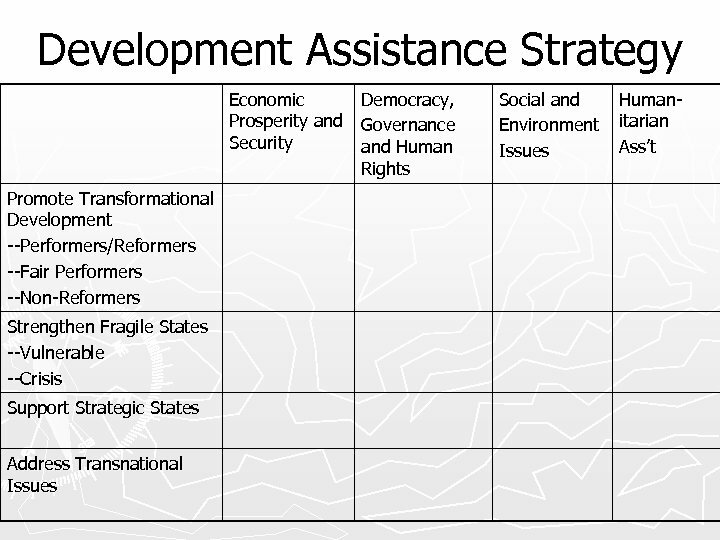 Advance Sustainable Development and Global Interests ►Democracy and Human Rights— Advance the growth of democracy and good governance, including civil society, the rule of law, respect for human rights, and religious freedom. 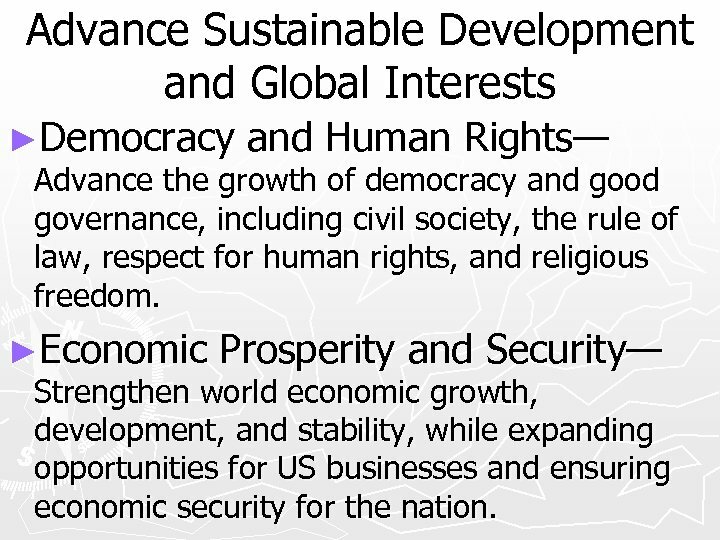 ►Economic Prosperity and Security— Strengthen world economic growth, development, and stability, while expanding opportunities for US businesses and ensuring economic security for the nation. 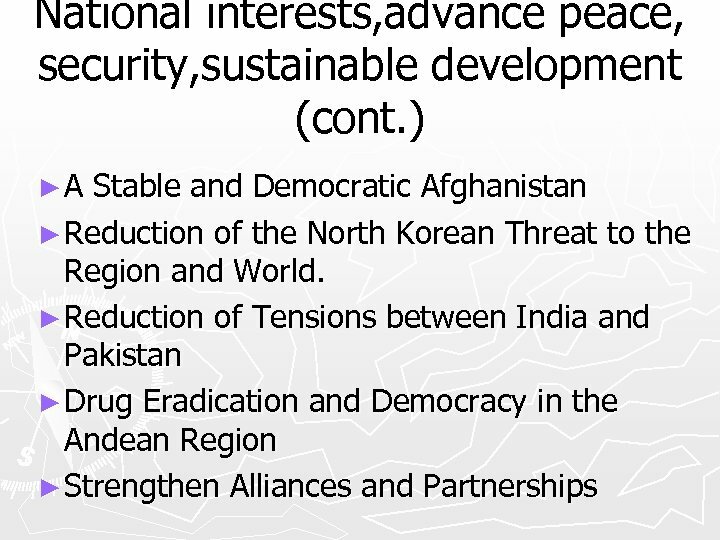 Advance Sustainable Development and Global Interests (cont. ) 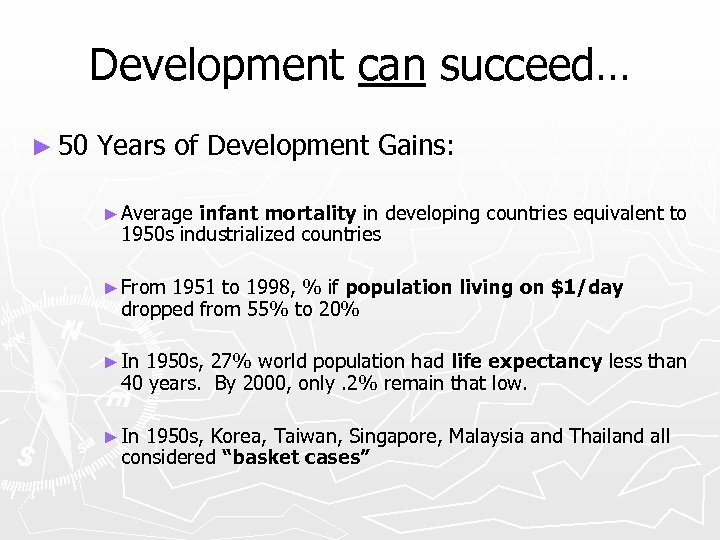 ►Social and Environmental Issues— Improve health, education, environment, and other conditions for the global population. 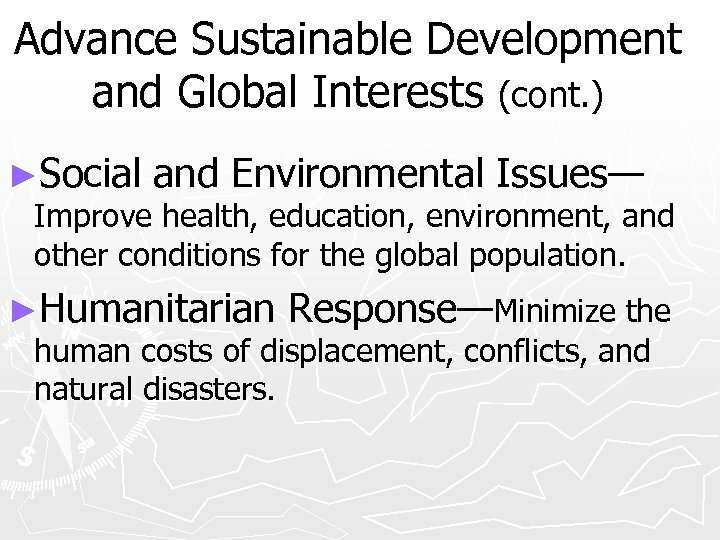 ►Humanitarian Response—Minimize the human costs of displacement, conflicts, and natural disasters. 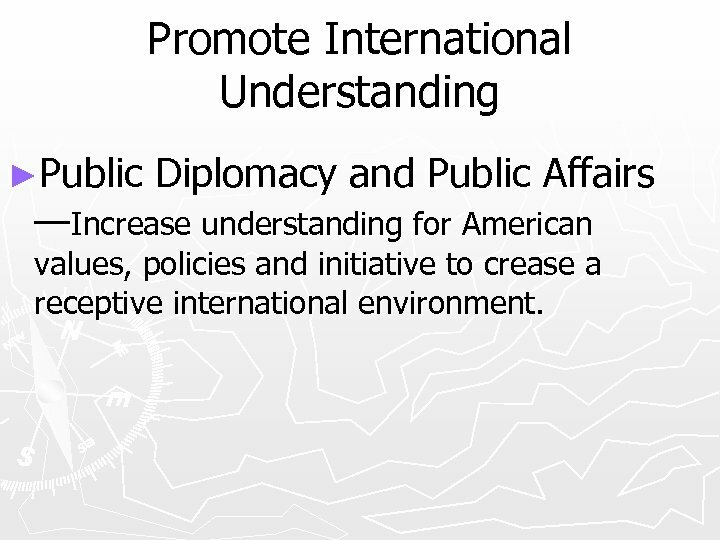 Promote International Understanding ►Public Diplomacy and Public Affairs —Increase understanding for American values, policies and initiative to crease a receptive international environment. 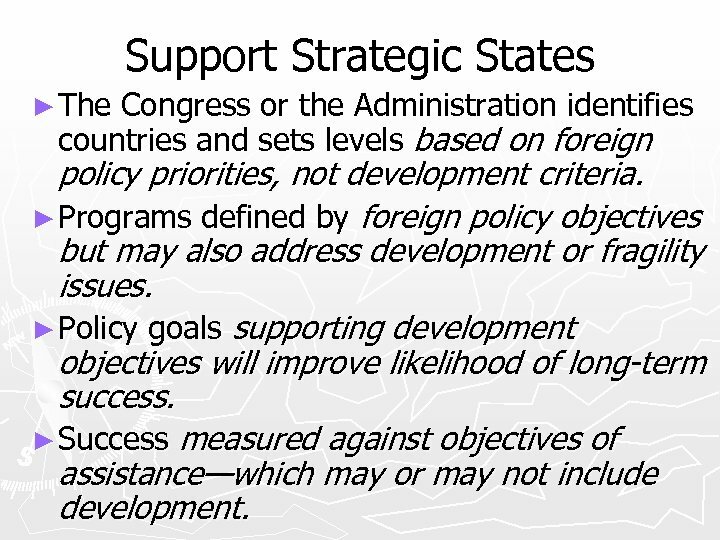 Support Strategic States ► The Congress or the Administration identifies countries and sets levels based on foreign policy priorities, not development criteria. 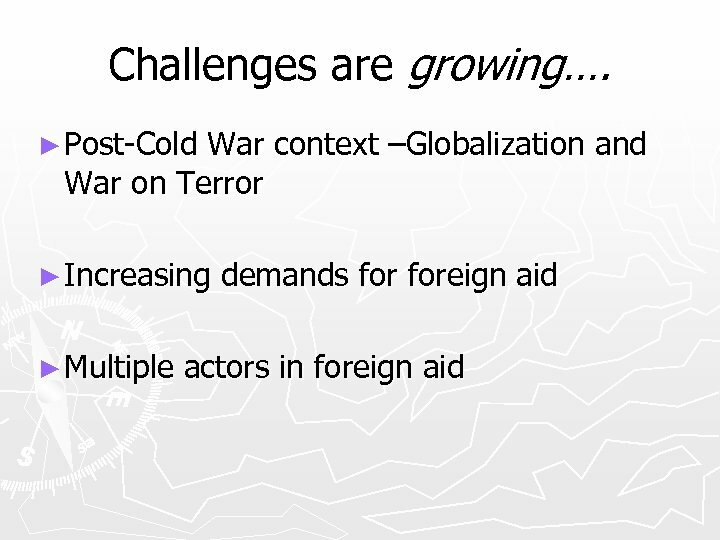 ► Programs defined by foreign policy objectives but may also address development or fragility issues. 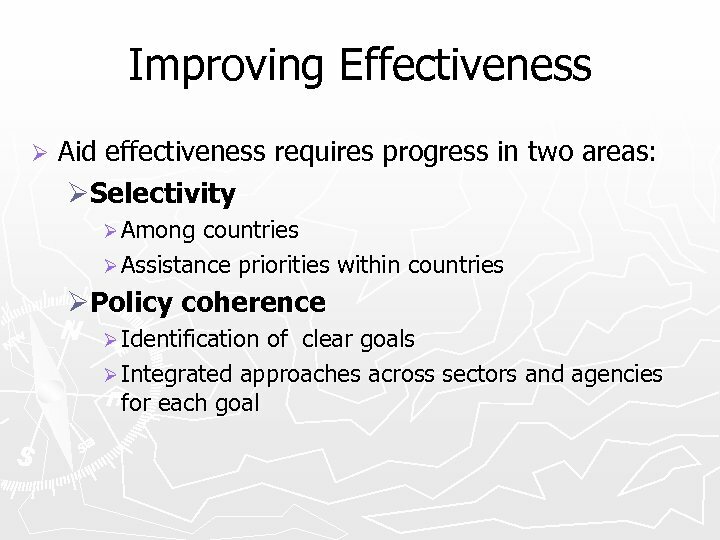 ► Policy goals supporting development objectives will improve likelihood of long-term success. 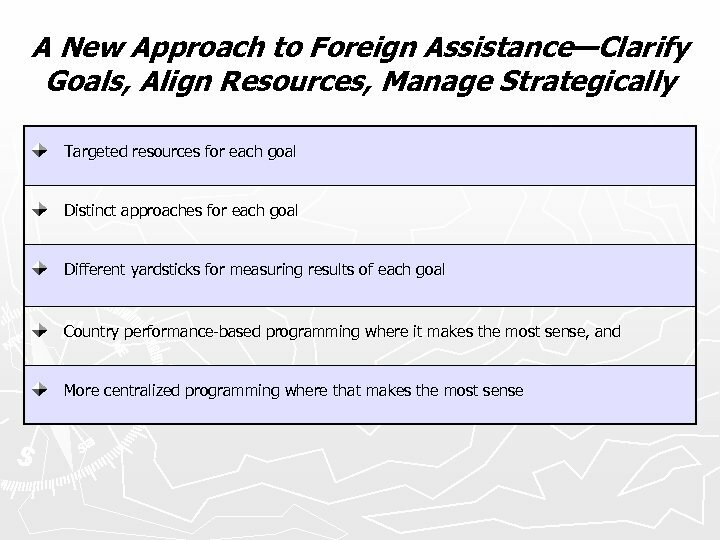 ► Success measured against objectives of assistance—which may or may not include development. 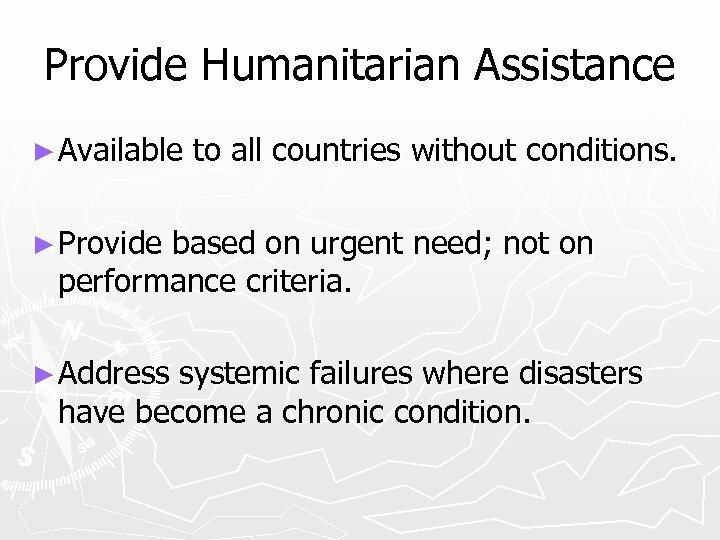 Provide Humanitarian Assistance ► Available to all countries without conditions. 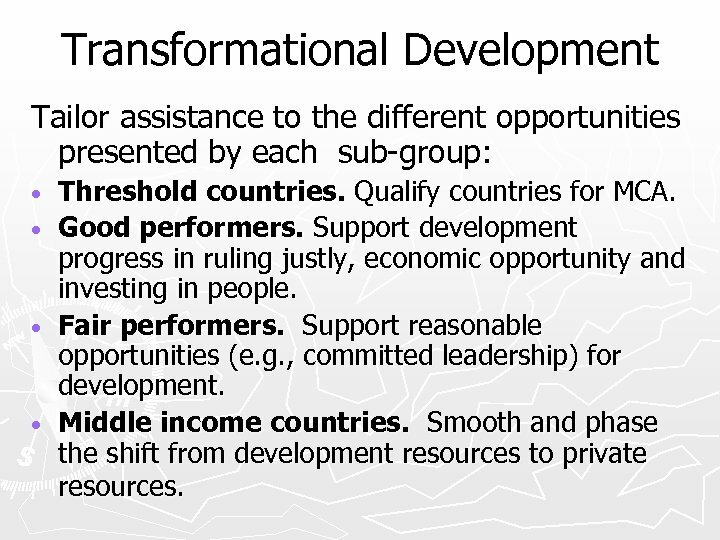 ► Provide based on urgent need; not on performance criteria. 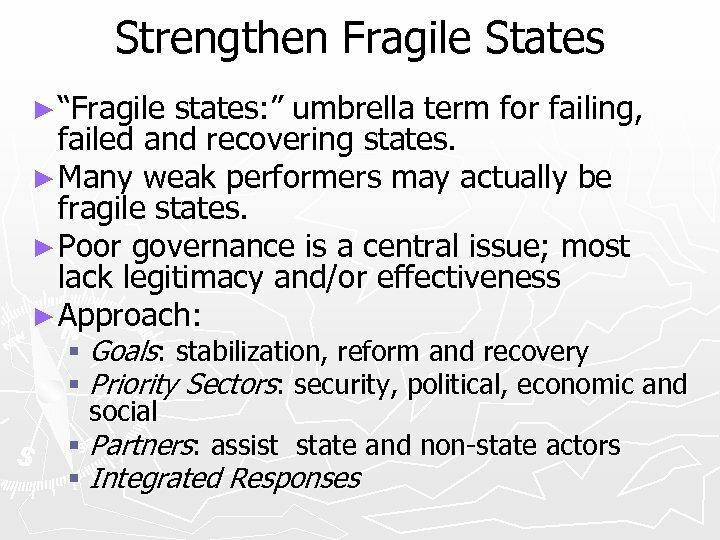 ► Address systemic failures where disasters have become a chronic condition. 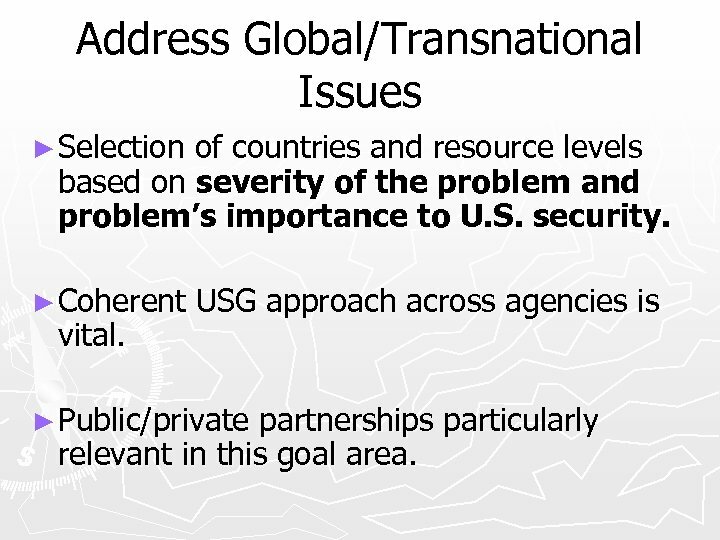 Address Global/Transnational Issues ► Selection of countries and resource levels based on severity of the problem and problem’s importance to U. S. security. 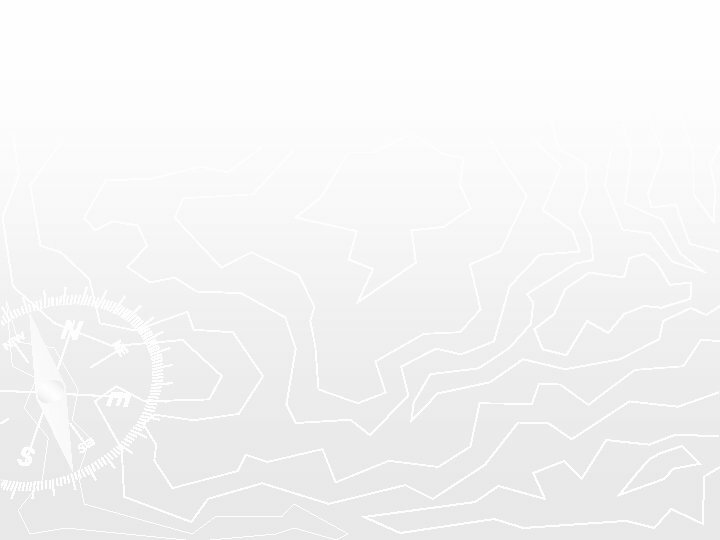 ► Coherent vital. 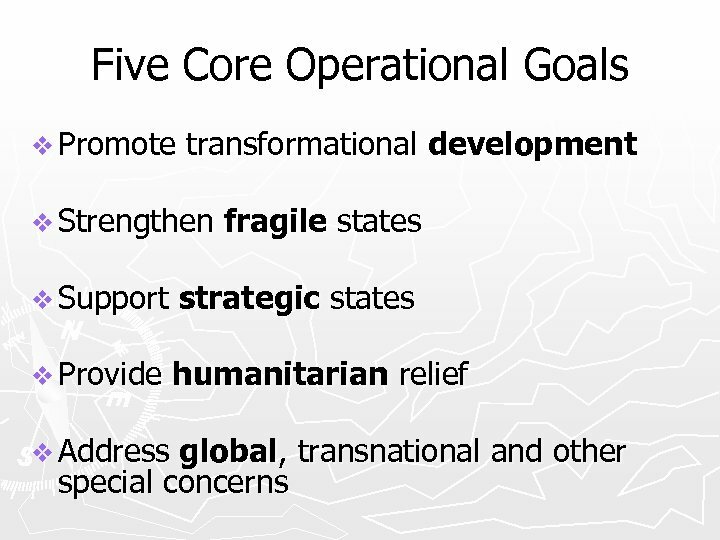 USG approach across agencies is ► Public/private partnerships particularly relevant in this goal area.